Description: Two NS widecabs pull an autorack train through CP Laurel. Description: NS intermodal 20E cruises east through snow covered CP Ford under the wires at Norristown behind a pair of dash 9's. 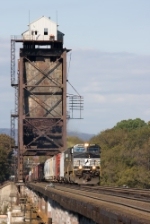 Title: MP 96 on the NS Harrisburg Line. Description: NS 9492 casting a long shadow in the early evening at Macungie. yet another very short train!! Description: UP 2883 wears its third UP number after being renumbered from D&RGW 5344 in 1999. Description: 3 junkwagons power NS gen freight 39G westward along the Delair Branch through Mantua. Description: Stanton Station Road, 1349 hours. Description: NS 9492 leads Triple Crown Train 252 east over Schreeder Brook in the early morning sunshine. Description: NS 9492 brings up the rear end of L89. Description: Heavy duty power sits over the Memorial Day Weekend due to NS taking a 2 day furlough over Memorial Day Holiday. Description: #112 rounds the curve at Huntsville at track speed preparing to exit the double track via a unique equilateral turnout.